Will anything stop the bike thieves? In order to ensure you get your bike back. The bicycle is the metaphor of life. Which impacts one’s behaviour over the years. Here you have the first poem in english! A way to reach more people and let them enjoy the project “Borracce di Poesia – Water bottles of poetry”. It was born in 2007 combining two passions: urban cycling and rhymes. The poems are spontaneous reflections by the project-creator who narrates the world from a saddle emphasizing the cyclist’s point of view. A way to recall the historical tradition and its poetical approach to cycling linking it to the modern role of bicycles in urban mobility. Nor be anti-conformist; what that may bring. 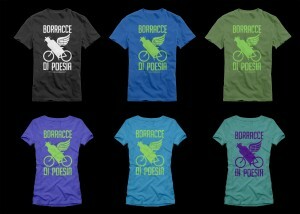 The project “Borracce di Poesia – Water bottles of Poetry” was born in 2007 combining two passions: urban cycling and rhymes. The poems are spontaneous reflections by the project-creator who narrates the world from a saddle emphasizing the cyclist’s point of view. A way to recall the historical tradition and its poetical approach to cycling in contrast with the modern role of bicycles in urban mobility. Sizes and colors: Man, M (black, blue, green); woman, S, M, (purple, blue, turquoise).